If you look at the bottom of each story page you will see an Amazon Link to buy this movie. 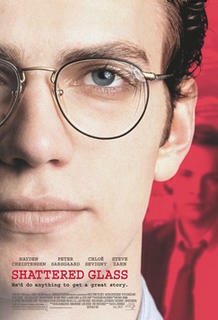 It is the story of Stephen Glass ... a former writer for the popular political magazine The New Republic. This magazine is read by anyone who's any one in Washington and read on Airforce One by the President. The story involves Stephen Glass and his insatiable appetite for embellishing stories. This and Catch Me If You Can are regularly on HBO. If you have never seen either movie, you should watch them - you will see a common thread of these stories and editorial subjects here at Fix Your Thinking. Most of the editorials at Jackwhispers focus on scams as they relate to the Macintosh Community. These two movies reveal two of the greatest scam artists in HISTORY!